RRResearch: A new way to make money from researchers? Basically, you give World Biomedical Frontiers $38 and they list your paper's Abstract on their website along with whatever supplementary explanation of the work you provide. I gather that "cutting-edge biomedical research" means "research by people who gave us $38". "This paper has been selected to be featured in World Biomedical Frontiers (http://biomedfrontiers.org/cancer-2013-may-2-5/) because of its innovation and potential for significant impact. World Biomedical Frontiers [ISSN: 2328-0166] focuses on cutting-edge biomedical research from around the globe." Your recent paper about influenza-“Defining the DNA uptake specificity of naturally competent Haemophilus influenzae cells” (published in “Nucleic acids research.2012 Sep;40(17):8536-8549.”) has been selected to be featured in our next issue of World Biomedical Frontiers, because of its innovation and potential for significant impact. Research results with significant potential to improve health – or to treat or prevent disease – often deserve an immediate leap onto the “front page”. However, scientific breakthroughs don't always make the front page – and some don't make any page! We are the platform for you to stand out from among ~100,000 papers published each month, in order to attract more attention from the public and potential investors. 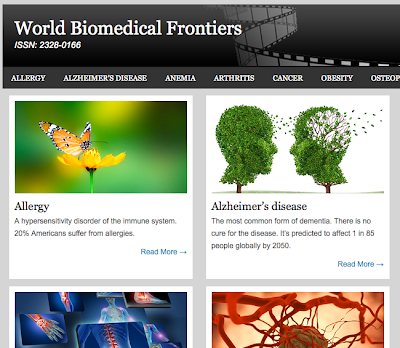 World Biomedical Frontiers [ISSN: 2328-0166] focuses on cutting-edge biomedical research from around the globe. Our website receives more than 11,000 visits per month from an international audience of academic and industrial researchers and developers, providing greater opportunity for your results to be recognized and appreciated. If you accept our invitation to feature your paper on our website, a $38 processing fee will be charged. We will then post the abstract/summary of your paper in the latest section of Infection and Immunity, with additional information from you highly recommended to further explain your novel findings and concepts in plain language; photos and/or figures are welcomed. Here are two examples (1 and 2). In order to report breaking publications in a timely fashion, we ask that you contact us within 2 weeks if you wish your paper to be featured in our next issue. Michael S. Yang, M.D & Ph.D. The sidebar is the most useful part of their website but I don't want to give them the pageviews so I'll just create my own bookmarks. Now, in principle, I'm totally for re-use and all that. I also think we may disagree on Apple Academic publishing's behavior. But this scam totally takes the cake. Even the most ardent re-use supporter must denounce this obvious rip-off! Granted, it's so blatantly obvious, only people who fall for Nigerian scams (or register for Spamferences in China) will not see through it. It's almost funny. Still, these sort of things ought to be brought to public attention, thanks for informing us! There's one of these for Psychology, PsychologyProgress.com. They send a very flattering email to the author, announcing that the author's recent paper has been specially selected to be featured on their website. It is only deep in the email that they mention a "small processing fee" of $35. Time will tell if there are enough vain and foolish people in academia for this to be a sustainable business model.